﻿ La Diguoise Guest House, Seychelles Islands | FROM $112 - SAVE ON AGODA! "The location is very cozy, clean, tropical." Have a question for La Diguoise Guest House? "Friendly and helpful staff, great outdoor area, breakfast acceptable, room standard as per our expectations..."
"The villas are more than generous and comfort nights are assured by the excellent a/c and fans." "The breakfast provided is good and the evening meal is delicious!" "Our stay was short but very nice." Well-positioned in La Digue Island, La Diguoise Guest House is the ideal point of departure for your excursions in Seychelles Islands. The hotel lies 0.5 Km from the city center and provides accessibility to important town facilities. For sightseeing options and local attractions, one need not look far as the hotel enjoys close proximity to Veuve Reserve Information Centre, Azzura Pro-Dive, Horse-Riding. At La Diguoise Guest House, the excellent service and superior facilities make for an unforgettable stay. Top features of the hotel include free Wi-Fi in all rooms, Wi-Fi in public areas, airport transfer, family room, restaurant. The ambiance of La Diguoise Guest House is reflected in every guestroom. television LCD/plasma screen, private pool, internet access – wireless (complimentary), air conditioning, desk are just some of the facilities that can be found throughout the property. The hotel's recreational facilities, which include outdoor pool, garden are designed for escape and relaxation. La Diguoise Guest House is a smart choice for travelers to Seychelles Islands, offering a relaxed and hassle-free stay every time. "A great way to eat local cuisine." The maximum occupancy for "Standard Room" and "Superior Room" room types are 2 adults and 2 children or 4 adults. Children 3-12 years old staying in the Standard Room can add a supplement of breakfast for EUR 35 or half board for EUR 45. Children 3-12 years old staying in the Superior Room can add a supplement of breakfast for EUR 50 or half board for EUR 60. Insist on getting a room in the villa when booking! Lovely location but bring a torch as it’s 900m up a lane that’s dark at night. Rooms functional but comfortable with outdoor terrace and tranquil gardens. Restaurant open air and airy with simple but satisfying breakfast of fruit, eggs, toast and homemade jams. Order the creole dinner... a great way to eat local cuisine. La Liguoise is a perfect location if you want to save money in Seychelles. The location is very cozy, clean, tropical. Everything you'll eat will be from the garden - bio. The island of La Digue is pretty small compared to Mahe or Praslin so getting around with a rented bike is perfect. You can rent bikes directly at the property. Save money on the accommodation and spend the rest on experiences such as: cocktails at sunset in Domaine de la Reserve or other fancy dinner spots. It was wonderful! Our stay was short but very nice. Friendly and helpful staff, great outdoor area, breakfast acceptable, room standard as per our expectations... For our next weekend gateway we will try to book higher categories, as this time they were not available. Do not follow Google’s pointed location...it’s nearby, parallel to the street shown on the map. Thank you very much! Set back further from the sea than you expect is LD set within its own beautiful tropical garden. The villas are more than generous and comfort nights are assured by the excellent a/c and fans. The breakfast provided is good and the evening meal is delicious! A bike is essential and enables the whole of this beautiful island to be explored; a much more laid-back holiday feel than its two larger neighbors. Surprisingly for such a luxurious complex, internet is only available in the outside eating area and painfully slow making the experience frustrating. To Far from the beach. This facillity Direct on the beach - that s it ! I'll summarise it like this: I have been to 142 countries around the world and very rarely I have met anybody as friendly and helpful as Christophe (the owner) & Co. The guest houses and its garden are beautiful, but the superb service is even better. Thank you La Diguose! The staff was incredibly kind, the property was gorgeous and the food was delicious! I stayed at La Diguoise for 6 nights with two friends (a couple), and we had the absolute best time possible. Georgette, the manager, was incredibly helpful and quite charming, and Sultan the watchdog was welcome company. Breakfast every morning was lovely and delicious, with incredible local jams and eggs and fresh fruit from right off the property. There was an adorable koi pond and garden area, and the pool was great for cooling down mid-afternoon. We loved the location, too -- it was off the main road on La Digue, so it was very private and cozy feeling, without being a far walk from the main town center (a 15 minute walk). I would visit again in a heartbeat! Owner and family were super friendly and very helpful. Beautiful room and excellent food! Nice, peacefull location, a lot of bird, beautiful garden. The owner was kind, but thr road to guset house was muddy. Don't waste your money and precious time on this disgusting guest house!!!!!!! The location is remote from the jetty, there is a muddy track from the inn to the mainroad, so riding at this road is very dangerous expecially in the evening,because there is no light at this track. the length of this road is about 500 metres. The air conditioning makes big noises in the midnight,I have not sleep for two days when I was stay in there. The breakfast is ok, but the staff put the breakfast at the balcony in the moring without notice and wraps, the geckos would eat the breakfast before you. so it's digusting. The inn doesn't have any security except a German shepherd, so be careful! I can guarantee you will definitely feel strange if you stay in the guest house. It is a lovely garden with a brilliant CHEF! You have to choose the half board as you can not miss the signature dinner and the location of the guest house is not convininent. You have to come back before sunset or bring torch light, otherwise, there is whole darkness only... The room is so so for the old facilities but very clean. We felt too humid there as the room is at ground floor. You can rent a bike in the guest house 100 rupees/ day. It is very clean, has a nice veranda where you can have your breakfast and the people here are very friendly. our 3 honeymoon nights at la diguoise were incredible. the chef is very friendly and helpful - he does a lot and ensures that all staff are content. la digue is very special. we discovered the whole island (5km by 3km) via bicycle and enjoyed the pit stops (for juice or a scenic beach) along the way. 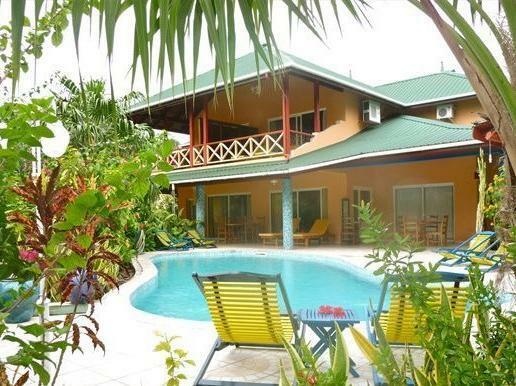 la diguoise was in a convenient and prime location in la digue - the cleanliness, nice garden, privacy and special ambience will ensure that we come to visit again. +)very nice garden, we were promoted to a premium room just by the pool for our honeymoon. -)500 meters away from the main road(beach), you will have to walk through a piece of woods to get there and the woods is not nice especially in the night without light. The service is correct but cold as some other guest already commented. No meat in breakfast, prepared yourself if you need more energy in the morning. Most weird thing is: The owner, suddenly get upset when I ask if we are the only Chinese in the guesthouse. Only trying to make a conversation but apparently he misunderstood. Though another manager-a woman explained to us later it was merely a misunderstanding but I still don't know how could this simple conversation be misunderstood? When I was leaving I tried to talk to the owner again, unfortunately the only thing I get was a very reluctant reply looks like the fast we leave the best for him. 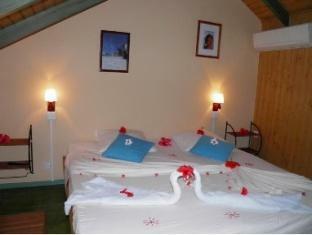 We stayed in Praslin also in guesthouse named Mango Lodge. Everything is much better than this and the price is lower. On the whole, it was not a nice stay in La Diguoise though La digue has quite a few views.